Combining elements of social work and health care and sharing important common ground, case management is a cross-disciplinary specialty practice based in advocacy seeking to identify the resources people need to achieve physical and mental health. Meeting the diverse and complex needs of patients today requires a holistic, person-centered approach that addresses physical and behavioral health. Given the aging of the population, growing prevalence of individuals with multiple chronic conditions that were once fatal, and greater incidence of depression as a comorbidity, more people across the health care spectrum require access to care and resources beyond a particular incident or episode. Increasingly, a holistic approach also must consider the social determinants of health—"conditions in the environments in which people are born, live, learn, work, play, worship, and age that affect a wide range of health, functioning, and quality-of-life outcomes and risks" (Office of Disease Prevention and Health Promotion, 2016). The more complex the needs, the more comprehensive the approach should be for creating an optimal case management plan to address the whole person. The social worker brings a patient-centered, holistic view—one that extends well beyond the patient's discharge from an acute care or subacute setting. As a key member of health care teams, the social worker is often the one relied on most to address how to meet the person's needs in the community. Social workers' person-centered approach is highly congruent with the practice of case management. In fact, case management has been a key function of social work since the founding of the profession (Commission for Case Manager Certification, 2016). Social workers' whole-person perspective and skill set make them valued members of interdisciplinary and, increasingly, transdisciplinary teams. Without a social worker, it may be virtually impossible for these teams to pursue a truly holistic approach. Case management is not a profession unto itself; rather, it is a cross-disciplinary specialty practice. This is reflected in the varied professional backgrounds of board-certified professionals who hold the Certified Case Manager® (CCM) certification. According to the most recent field research conducted by the Commission for Case Manager Certification (CCMC) in 2014, while nursing was the most common professional background for case managers (88.8%), social workers accounted for 5.8%, a significant percentage (Tahan, Watson, & Sminkey, 2015). Although the percentage of social workers has remained constant, the overall number of current CCM certificants has grown, from approximately 30,000 to 40,000. Thus, the population of social worker case managers continues to grow. Case management is defined as a "professional and collaborative process that assesses, plans, implements, coordinates, monitors, and evaluates the options and services required to meet an individual's health needs" (Commission for Case Manager Certification, 2015). For the case manager, the highest level of responsibility is to the patient (client). As advocates on behalf of these individuals, case managers are obliged to coordinate care that is safe, timely, effective, efficient, equitable, and client-centered. Throughout the case management process, case managers act with consideration for the individual's cultural beliefs, interests, wishes, needs, and values. Case managers are responsible for helping clients and their support systems evaluate and understand care options, determine what is best to meet their needs, and institute action to achieve their goals and meet their interests and expectations. In addition, according to www.cmbodyofknowledge.com, the case management process assists health care organizations and professionals to meet their goals, such as delivery of safe, quality, cost-effective, and efficient care, as well as demonstrating adherence to regulatory and accreditation standards. The case management process is highly congruent with social work practice. NASW defines social work practice as applying the "values, principles, and techniques" of social work to achieve one or more of the following: "helping people obtain tangible services; counseling and psychotherapy with individuals, families, and groups; helping communities or groups provide or improve social and health services; and participating in legislative processes" (NASW, n.d.). Grounded in advocacy and seeking to identify the resources people need to achieve their physical and mental health goals, social work and case management share important common ground. There are other commonalities and contributions at the intersection of social work and health care when taking a case management approach. Increasingly, case management practice focuses on measuring quality and outcomes; in fact, it is now considered an "essential activity," as defined by the most recent role and function field survey conducted by the CCMC. Individual case managers across multiple disciplines are experiencing greater emphasis on evaluating quality and outcomes, such that these responsibilities are becoming part of their regular jobs and day-to-day responsibilities. These responsibilities vary, depending upon the practice setting. In the hospital setting, for example, an important aspect of outcomes is improving transitions of care, such as from acute care to subacute or discharge into the community. Improved transitions are key to reducing readmissions in order to avoid penalties and reduced payments from Medicare and other payers because of excessive readmissions within 30 days of discharge (Watson, 2016). Another factor in reducing readmissions is to ensure patients have the necessary resources and support postdischarge. In pursuing these goals of better patient follow-up and reducing avoidable readmissions, social workers are particularly well equipped to identify resources in the community, such as meal support for homebound patients or arranging transportation to doctor visits. This expertise makes social workers particularly valuable members of health care teams composed of multiple disciplines. Across the health care spectrum today, teams of health and human services professionals are increasingly being engaged. These teams are known by different names; one of the most frequently used is the interdisciplinary team, in which different disciplines interact to reach a common goal, with each professional contributing his or her expertise. A transdisciplinary approach differs from the interdisciplinary in that it requires team members to be sufficiently familiar with the approach of each. With a transdisciplinary approach, the focus remains team based, but all disciplines are "viewed as having an equally important role in the patient's care, and with each team member having expanded knowledge of the role that each discipline plays on the team" (Little, 2010). The transdisciplinary model of care has become "an important new tool for improving physical and mental health outcomes" (Little). In order to address both physical and mental health, the transdisciplinary team must include a social worker. A transdisciplinary approach empowers teams to pursue the "triple aims" in health care: improving the experience of care, achieving better health of individuals and populations, and reducing the per capita cost of care (Berwick, Nolan, & Whittington, 2008). Pursuing the triple aims puts case management in the spotlight with direct responsibility for undertaking quality measurement and evaluation of the systems of care delivery and the impact on patient care outcomes and experience of care (Tahan, Watson, & Sminkey, 2016). This is especially relevant given the emergence of new models of care delivery in recent years. These models include the patient-centered medical home—a care setting that facilitates partnerships among the individual, the person's support system, and primary care providers—and the accountable care organization, an integrated care delivery system in which health care providers and organizations delivering health care services are responsible for the quality and cost of that care for Medicare patients. These models put the onus on transdisciplinary teams working together to ensure achievement of desirable outcomes. As the CCMC found in its role and function study, "the professional case manager is uniquely prepared to impact the experience of both the patient and the health care organization in the systems of health and human services delivery" (Tahan, Watson, & Sminkey, 2015). To address the needs of the individual, social workers—and in particular social workers in the health care setting—lend their unique person-centered perspective and expertise. In hospitals and other health care settings, social workers are acknowledged as being on the front line of providing services to patients. For example, hospital social workers are often used to provide support and help for patients and their families, from emotional support to counseling. Hospital social workers use case management skills to provide a holistic approach for meeting the psychosocial needs of patients and their families (NASW Center for Workforce Studies & Social Work Practice, 2011). The expanded role of the social worker in the health care setting has brought about an emerging role of the health care social worker. For example, as hospitals and care facilities expand their outpatient centers or ambulatory care centers to address the influx of patients resulting from the 2010 Patient Protection and Affordable Care Act, health care social workers are an important addition. With expertise in health care, these social workers provide support such as helping explain diagnoses and treatment options, as well as helping patients obtain financial assistance. Health care delivery models increasingly rely on social workers and social worker case managers because of their specialization in identifying and meeting the needs of patients postdischarge. This includes accessing the necessary care and treatment resources in the community, such as elder care services, fraternal/religious organizations, government programs, meal delivery services, and pharmacy assistance programs (Tahan, Watson & Sminkey, 2016). These postdischarge needs speak of the need to understand and address social determinants of health. It is widely acknowledged that a variety of factors can influence population health, including "safe and affordable housing, access to education, public safety, availability of healthy foods, local emergency/health services, and environments free of life-threatening toxins" (Office of Disease Prevention and Health Promotion). Other social determinants include access to health care services, transportation options, and social support, among many others. In an interview for this article, Virna Little, PsyD, LCSW-r, MBA, CCM, SAP, senior vice president of psychosocial services/community affairs for The Institute of Family Health, underscored the importance of addressing the social determinants of health, which increasingly are recognized as driving health outcomes. At the same time, the skill set of the social worker matches the need for networking and coordination of community resources to address the social determinants. Social workers have expertise in mental health that is particularly relevant for the majority of "high-touch care management population," which Little defined as having multiple comorbidities, including depression. Multiple chronic conditions are receiving increased attention in health care. For example, the U.S. Department of Health & Human Services (HHS) emphasizes training and education for health care professionals to serve the needs of people with multiple chronic conditions. Chronic conditions, both physical and mental, are defined as lasting a year or more and requiring ongoing medical attention and/or that limit activities of daily living. Multiple chronic conditions are defined as two or more chronic conditions that concurrently affect a person. These conditions are associated with a high proportion of consumption of health care resources. According to HHS, approximately 66% of total health care spending in the United States is associated with care for the more than one in four Americans with multiple chronic conditions. Among older Americans (aged 65 and older) as many as three out of four people have multiple chronic conditions and approximately two out of three Medicare beneficiaries have multiple chronic conditions (U.S. Department of Health & Human Services, 2016). The rising incidence of chronic conditions, especially multiple chronic conditions, intensifies the challenge of how to provide quality care, particularly to a growing number of aging individuals with multiple health problems and complex needs. In "Mental Illness Surveillance Among Adults in the United States," the Centers for Disease Control and Prevention identifies a correlation between chronic medical diseases and an increase in mental health disorders. It is also well documented that chronic disease exacerbates or triggers symptoms of depression. As the links between chronic disease and depressive disorders are recognized, the transdisciplinary team is better able to discuss the individual's physical and mental health (Carter, Zawalski, Sminkey, & Christopherson, 2015). As a transdisciplinary team member, the social worker is uniquely qualified to identify the signs and symptoms of these concurrent mental health issues that can accompany chronic illnesses. Within health care, and particularly in the primary care setting, social workers are cost-efficient providers of behavioral/mental health services, which are billable to insurance in most states and in many care settings. Across the health care spectrum, social workers can identify and implement interventions for individuals with comorbid mental health issues, including behavioral interventions, to help improve physical and mental health. Social workers may find more opportunity to meet the growing demand for health care case managers. This is the impetus behind the collaboration between the CCMC and NASW, whereby social workers who qualify for the NASW Case Management credential will prequalify to take the CCMC certification examination. The collaboration creates new opportunities for bachelor degree–level social workers and those with advanced degrees to assume an active role in hospitals, health plans, clinics, and other health care settings. The evolution of the health care social worker, including those who pursue certification as case managers, is a natural outgrowth of the highly visible intersection of health care and social work. The aging of the U.S. population, greater incidence of complex health conditions, and the prevalence of multiple chronic conditions highlight the need for a holistic approach to physical and mental health. With their person-centered approach, social workers are vital members of transdisciplinary care teams to address multiple factors that influence health and wellness, including the social determinants of health. Social workers whose practice is rooted in case management are integral to meeting the needs of individuals for whom care and resources must be identified and deployed beyond discharge. As the "triple aims" of care, health, and cost are addressed across multiple settings and by a variety of disciplines, social workers now play an increasingly important role and will continue to do so in the foreseeable future. — Jane Harkey, RN-BC, MSW, CCM, is the chair of the Commission for Case Manager Certification. She also operates a private geriatric care management practice based in New Jersey. Berwick, D. M., Nolan, T. W., Whittington, J. (2008). The triple aim: Care, health, and cost. Health Affairs (Millwood), 27(3), 759-769. Retrieved from http://content.healthaffairs.org/content/27/3/759.abstract. Carter, J., Zawalski, S., Sminkey, P., Christopherson, B. (2015). Assessing the whole person: Case managers take a holistic approach to physical and mental health. Professional Case Management, 20(3), 140-146. Little, V. (2010). Transdisciplinary care: Opportunities and challenges for behavioral health providers. Journal of Health Care for the Poor and Underserved, 21(4), 1103-1107. NASW. (n.d.). Practice. Retrieved from http://socialworkers.org/practice/default.asp. 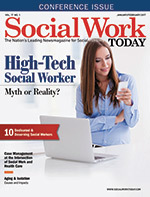 NASW Center for Workforce Studies & Social Work Practice. (2011). Social workers in hospitals & medical centers. Retrieved from http://workforce.socialworkers.org/studies/profiles/Hospitals.pdf. Tahan, H. M., Watson, A. C., & Sminkey, P. V. (2015). What case managers should know about their roles and functions: A national study from the Commission for Case Manager Certification: Part I. Professional Case Management, 20(6), 271-296. Tahan, H. M., Watson, A. C., & Sminkey, P. V. (2016). Informing the content and composition of the CCM certification examination: A national study from the Commission for Case Manager Certification: Part II. Professional Case Management, 21(1). 3-21. U.S. Department of Health & Human Services. (2016). About the multiple chronic conditions initiative. Retrieved from http://www.hhs.gov/ash/about-ash/multiple-chronic-conditions/about-mcc/index.html. Watson, A. C. (2016). Evaluating and measuring quality and outcomes: A new "essential activity" of case management practice. Professional Case Management, 21(1), 51-52.